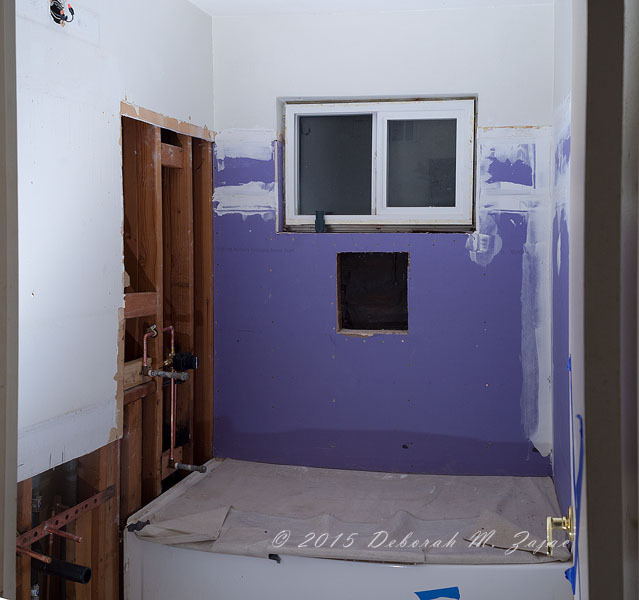 Home Improvement Phase 1 Update! Copyright©2015 Deborah M. Zajac. ALL RIGHTS RESERVED. 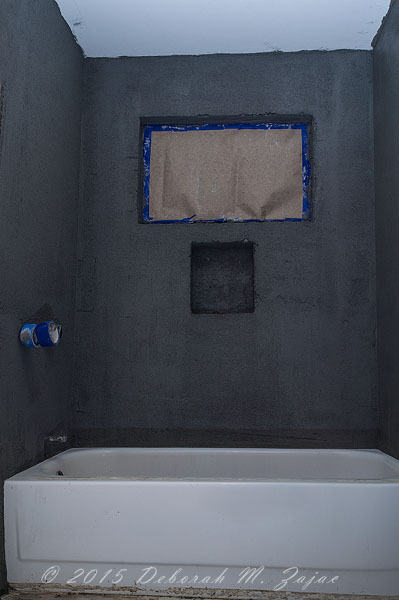 17 days in and the Hall Bathroom is just about finished! 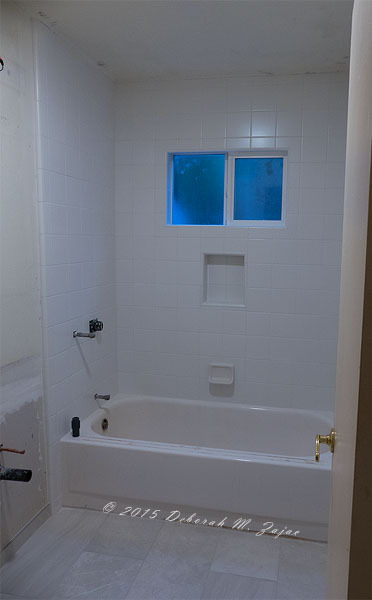 Not ready to use because the grout sealer in the shower and floor tiles were just applied today, but we can move in and begin using it again on Friday night. It’s beautiful! There was a minor “ruh-roh” today. While installing the threshold a corner of a tile was broken so they’re going to replace that. Once that is done it will be truly finished. No word on when the replacement will happen yet. It was late in the day so the Boss probably won’t get the Foreman’s notes or our follow up email until tomorrow. I made images of the work as it was progressing. Can you stand to look at the images? It’s like “Home Movies” isn’t it? If not just scroll down to the bottom of the post where I have inserted an image of how the Hall Bathroom looks tonight…sans any cute stuff. 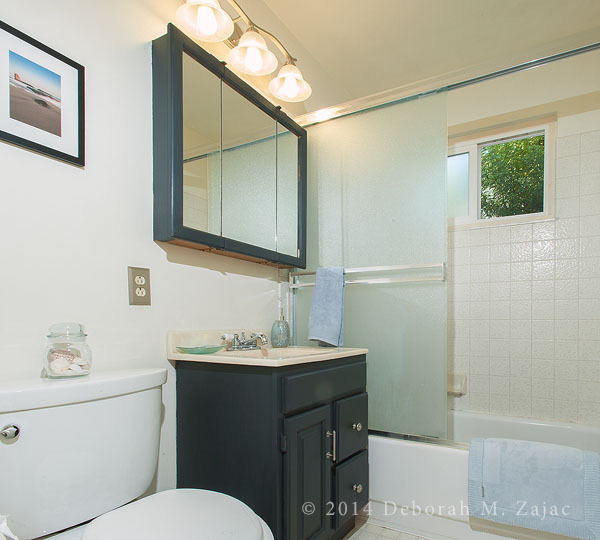 I spent a full week-end painting the mirror and vanity in a lovely Blue, and I changed all the fixtures to a Brushed Nickle, and the art work is mine. 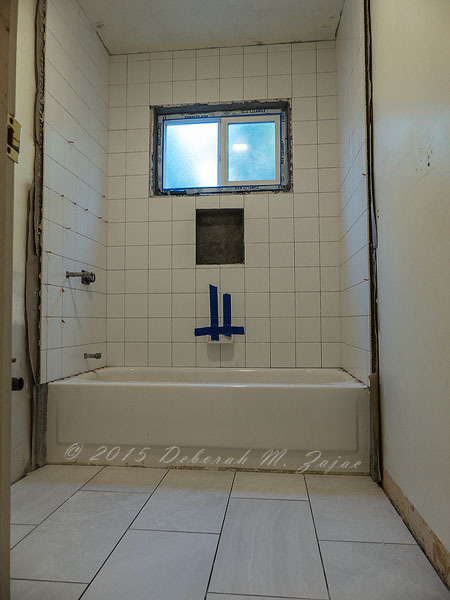 The Brushed Nickle light and switch plates will be used in the Mstrbath in Phase II. Day 2: The water protecting walls go in. Now it’s Purple Board. 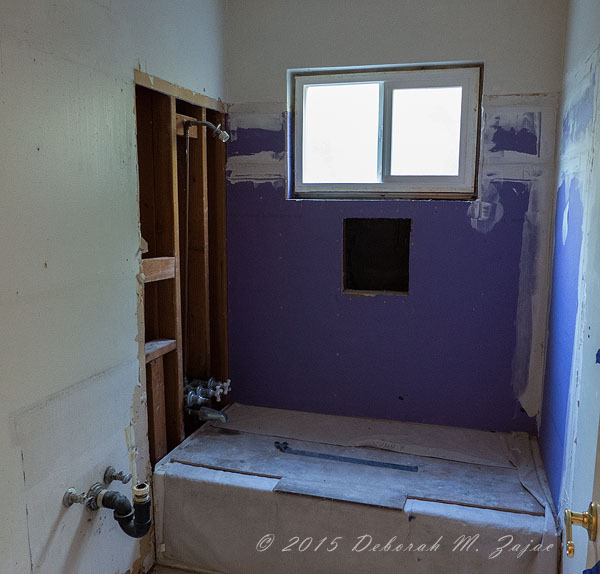 Day 3: Rough Plumbing done for both the sink and shower fixtures. All the walls are up and ready for Texture. Day 5; Some kind of Mud. They called it “Floating”. (Shrug) Some things…you just don’t ask. You just have faith…right. Day 6: Oh my! The Tile Guys were amazing. 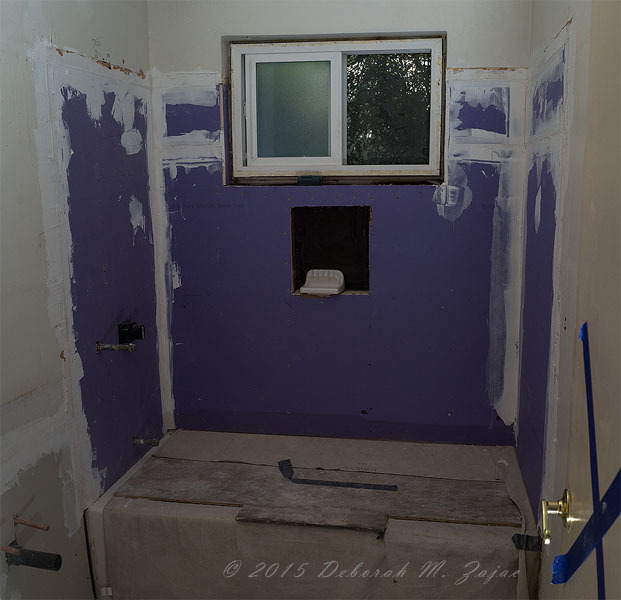 They laid both the shower and floor in a day! Day 8 the Tape and Texture guy was here. He’s a really skilled guy. I have to say I don’t like the texture on the new wall; it’s too busy and the pattern is too predictable, and at first I found the bathroom texture too “dense, and crispy”, but after two coats of paint it’s really nice. I still don’t like the new wall texture though. 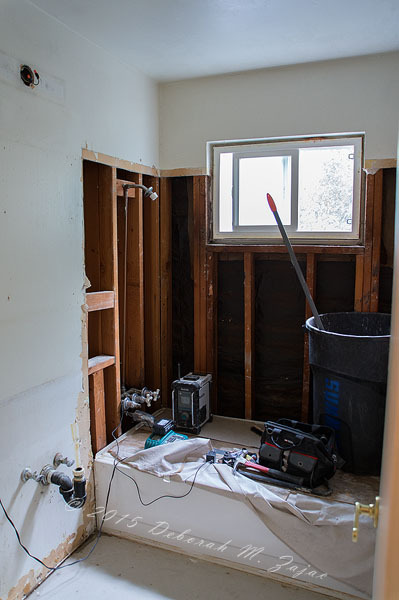 Day 9: The Painter arrived and painted the Hall Bathroom, and primed the new walls, the pocket door, and in the closet where the new attic space is, and the hallway where we hoped to put the new attic entry, but that didn’t work out so, it was a hole we have to patch. ( everyone sighed)! I love Sherwin Williams “Dover White”. Nearly my whole house is that color…minus two bedrooms, and the trim. So the bathroom is “Dover White semi gloss. 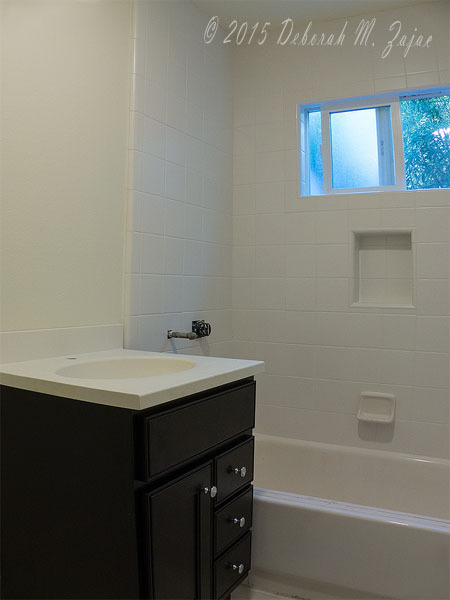 After he finished the installation Crew arrived and put in the Door Trim for the new Pocket door and cut the vanity top and installed the top and vanity. Fast forward through the week-ends and you’re now at today. Here’s the bathroom as it looks tonight with the fixtures and all the cabinets installed. 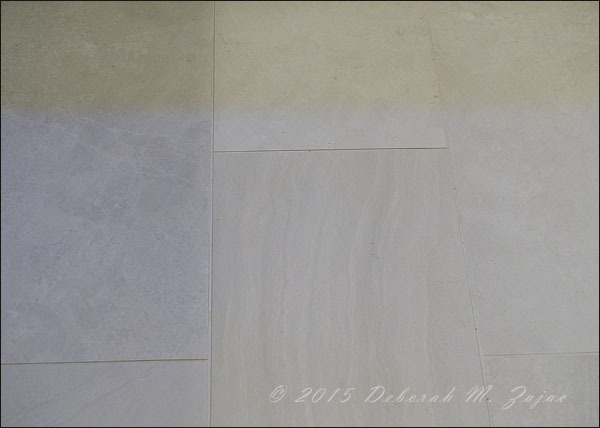 I love how much the floor tiles look like Marble. They’re definitely colder than our old Linoleum so we’ll need throw rugs for sure. I have a bath mat, towels, and cute stuff to put up, but I need to figure out where to put the Hand Towel… I used to put it on the shower door, but I have a shower curtain now. 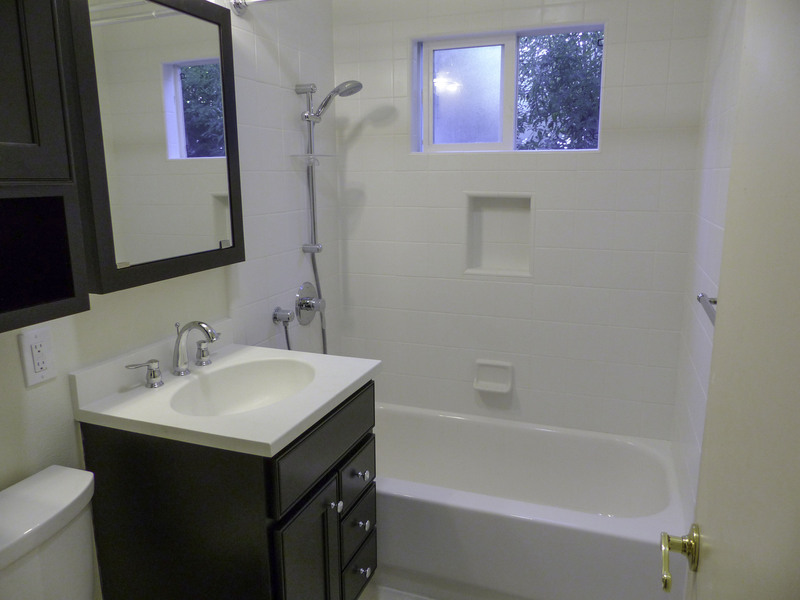 There’s no room between the sink/vanity and the shower. Any ideas or thoughts from those who have the same issue? That’s all for now. I’m sure you’re bored to death! So I’ll show you the new wall and pocket door tomorrow. I love these projects. thanks for sharing the in-progress photos.